"Wantirna College is beginning construction on our second hovercraft using the DiscoverHover One plans ... because they work! Having no experience in this type of project, we rely heavily on the DiscoverHover One plans and the DiscoverHover web site for guidance. The project has been a great experience, with very positive feedback from parents, students and staff. One long-serving staff member says this is the best project he has seen at the school in his 22 years. And the 14 students in the Technology Club have seen their ranks swell to more than 40 students. Wantirna College year 9 & 10 students during the construction of their DiscoverHover One hovercraft. As an educator, the rewards I've received from your program cannot be put into words. When you have a student who believes he or she can't do math sit down and persist in transferring measurements and angles from plans to timber, calculating cuts so they can get the most out of the timber they have available, and to make the hovercraft fit together properly -- that learning speaks for itself! Wantirna College has made a commitment to the DiscoverHover school hovercraft program. I see it playing an important role in the school's growing identity as a leading government school in the eastern suburbs of Melbourne." "I can't tell you how excited my students are about building a hovercraft. I've been teaching for 30 years and I cannot remember this level of excitement in any other project I have done with students. And their parents cannot believe that their 6th and 7th grade kids are doing something like this. It's a great project, and it brings to life the math and science they are learning in their other classes. It brings excitement to education: math and science now become something my students want to understand so they can apply that knowledge to building their hovercraft. This year the hovercraft construction is an after school Tech Club activity, but next year I'm going to incorporate the DiscoverHover project into the curriculum so it will be fused into a part of what I teach every day. I found DiscoverHover.org to be outstanding. The online curriculum guides were one of the main reasons I first went to your site. From there I saw everything else, and thought, 'Wow!'" "We're building our hovercraft as a Technology Education II class project, 18 students, sophomores through seniors. One of the most valuable aspects of the project is the excitement of the students. Our enrollment went up this year, and I think this has played a part in that. I demonstrated our hovercraft last week to about 40 Physics teachers from northern Illinois and gave them your web site. They're very excited about it. Physics classes can really benefit from the DiscoverHover curriculum guides." "This is the first time I've done a hovercraft project with my students. It was their idea and they're extremely excited. I teach design, so the design they're using is completely original - I wanted the students to do full-fledged research on what's out there, then engineer from scratch. DiscoverHover.org has been a large part of that. The site is great, very positive. We're planning to use the hovercraft as a marketing tool to demonstrate to high schools and say, 'Hey, look what you can do at AASU, look how much fun you can have." "It is of great interest that we came across your website. We have been searching for a project to take us over the coming annual school break (eight weeks) to keep our students occupied and out of mischief, a difficult task as you can appreciate. We have scoured the Internet for the right ideas but have just found the usual stuff – cars, bikes, go-carts and such. Then one of our younger fellows shouts, "Eureka! It has got to be a hovercraft!" As we are very close to a tidal river with mudflats it does seem a very exciting project indeed. We have kindly been donated a 250cc motorbike engine and the local timber merchant has promised us access to as much sheet plywood as necessary. Keep up the great work!" "I have been working with the Australian Hovercraft Federation President, Ken Osmond, on both hovercraft construction at my school, Billanook College, and on promotion of hovercraft construction to schools. I also have extensive involvement in organising and promoting the Australian International Model Solar Vehicle Challenge. The DiscoverHover program looks to be a fabulous project which will engage many students." I just wanted to thank you for taking time out of your busy schedule to talk with us and share your work. We certainly learned a great deal. As teachers we don't often get the chance to get involved in the business community, especially a "pioneering industry." We are excited about the possibilities of designing an instructional unit around manufacturing in the Wabash Valley. Your reference to Adam Smith and the division of labor seems to us to be a good starting point, for this principle can be simulated in the classroom. Investigating the hovercraft industry and discovering the uses for this vehicle [that rides] on air will instantly capture the interest of our students. As soon as we get moved into our new school and back online, we plan to access the DiscoverHover.org website. Hopefully this can become a big part of our project with the students. We are not yet sure of the shape of our instructional design, however, we noted well your advice that we can't focus on everything. Again, thank you for showing us how the hovercraft is made. We thoroughly enjoyed our time with you. Your pioneering spirit is apparent. "I'm very excited about this new group, mainly because now for the first time the hovercraft industry is actively helping young people and students everywhere get hands-on experience with hovercraft by sending plans free, so any and all schools or instructors can participate." Zang continues, "I have been involved with many school hovercraft projects and have learned what great learning projects they are and how excited the young people are to build and operate their own craft. Now any interested student or organization can participate." "The idea of hover building projects is what should have been done a long time ago. I hope there are kids who can scrape the money together to buy a ticket [to Australia]. The website layout is beautiful." 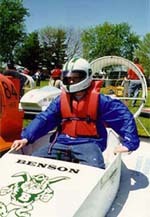 Photo: Stephen Snyder of the Benson High School Hovercraft Team awaits the green flag at Hoosier Hovercraft Championship 2003, Terre Haute, Indiana USA. "As a teacher, this has been and will continue to be one of the best projects we do in Engineering Technology. It has increased our enrollment in this course so much that next year we have to expand it to four periods instead of three. Students ask me in the hallway everyday, 'What class do I take to make the hovercraft?' Our students have nicknamed our school Hovercraft High!" "This is a golden opportunity for young people to get involved with a worthwhile and extremely interesting activity. There are more than ten million high school students in the U.S. alone. From my own experience in schools, I believe one in twenty would be willing and eager to build their own hovercraft if it were easy enough and they had the necessary guidance. Perhaps the most important factor regarding school hovercraft projects is that they involve young people in a challenging and satisfying experience, making lifelong impact." "It's a fun class to teach, a chance to apply physics, math and science in a practical way. The program has made the school look very good - a tremendous public relations program." "I am looking at collegiate programs involving hovercraft which both the university and students can afford. I am much more interested in a program where the students can engineer their way to success rather than buying their way in." "Excellent learning experience for kids not involved in other [programs]." "Fantastic problem-solving activity, and reinforced math, science and physics skills." "We would do this (build a hovercraft) again in a heartbeat if we could get funding."